The Walhalla is located in a dominant position high above the Danube in the vicinity of Regensburg. 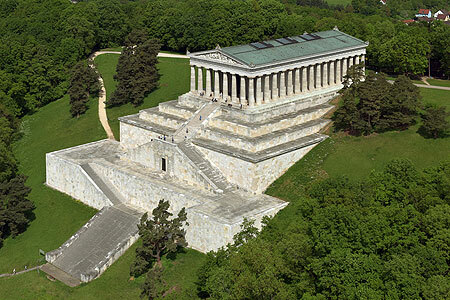 This Neoclassical building in the form of a temple surrounded by a portico with columns represents one of the most important German national monuments of the 19th century., which was created by order of the Bavarian king Ludwig I (reigned 1825-1848). After 1807, in the wake of what was seen as a humiliating defeat by the Napoleonic armies, Prince Ludwig decided that when he became king he would build a place of remembrance for German-speaking men and women of outstanding merit as an inspiration and reference point for the nation. Under the influence of the historian Johannes von Müller, who also made the initial selection of the personalities to be honoured, the German pantheon was called Walhalla after the warrior’s paradise of Germanic mythology, Valhalla. The Walhalla was built by Ludwig’s I favourite architect, Leo von Klenze (1784-1864), one of the most important Neoclassical architects of the 19th century. The foundation stone was laid in 1830 and the building was ceremoniously opened twelve years later, on 18 October 1842. Klenze’s design was primarily inspired by the famous Parthenon on the Acropolis in Athens dating from 5 BC. The combination of colonnaded temple and massive substructure and the free design of the interior however prevents the architecture from being a mere copy of the ancient building. The temple building, which is clad inside and out with precious marble, rises above the massive tiered substructure. This was originally intended to house the ‘Hall of Expectation’ containing the busts of people to be honoured in the future. 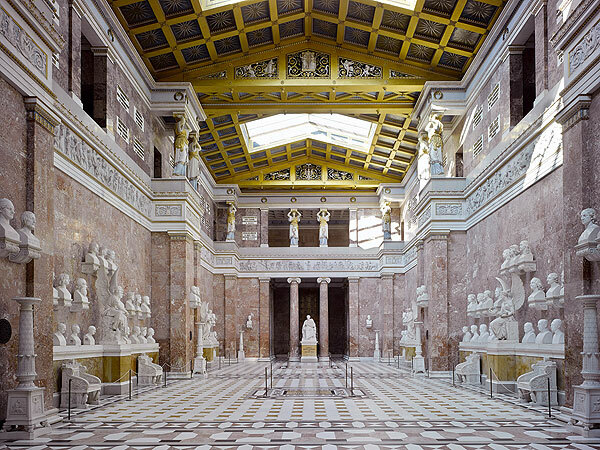 Along the walls of the interior are the busts and memorial plaques of the ‘Walhalla comrades’ chosen by Ludwig I and his advisors, a selection of rulers, generals, scientists and artists considered exemplary in the 19th century. The frieze of figures by Martin von Wagner above them depicts an ideal history of the Germanic people from the first migrants to Christianization in the early Middle Ages. Since 1962 new busts have been added to the original 96 at intervals of five to seven years. The selection is made by the Bavarian Council of Ministers, advised by the Bavarian Academy of Sciences. Since 2016 the Walhalla has been administered by the Bavarian Palace Department. Due to an event the Walhalla will have to be closed to the public on Wednesday, 29 May 2019 at 3 pm (last entry: 2.45 pm). We ask for your understanding for the restriction. Visitors to the Walhalla are urgently advised to keep strictly within the white markings. Children in particular must be supervised. The Free State of Bavaria and its staff are not liable for any contraventions of this regulation. Visitors with mobility problems who are in possession of a EURO key can drive up to the Walhalla. The entrance level is accessible via a ramp.